I've been absent. For quite awhile. And although I would like to say that in my absence from blogging I have been filling my time with crafting. But that would be a lie. I haven't been in my craft area except to pass through it to the laundry room. Which I have been filling my time with. Laundry. And lots of it. And other activities of course. Not all laundry. Some activities have been very fun...lot's of time spent outdoors in this amazing and fabulous Fall that Wisconsin has experienced. Lots of time here and there visiting kids. My kids....I haven't been out and about just visiting random kids ;-D and lots of time reading lately. I have been on a reading tear for some reason and it has been wonderful. I also have visited my brother and in the process was gifted from him my grandmother's old china cabinet that he has had in his barn for....well, forever I think. So, I have cleaned that up and filled that up with crafting supplies. Which led to a complete overhaul of my crafting room, supplies....any and everything that has to do with my crafting. This took me a looooong time. Too long in fact. It pointed out to me that I have a lot- A LOT of crafting supplies. And, so I have been paring away, giving away and reorganizing my supplies in a way that I will be able to use more of what I love more often. I have learned that I hate to have stuff on my desks.....in fact any of my flat working surfaces. Hate it. Hate the clutter that builds up. This has taken me way too long to figure out. I really must be slow in that respect. But, when I have on my desk....and I have a huge desk that can certainly accommodate this arrangement btw....when I have my pens, markers, inks and pencils neatly stored on my desk it is a baaaaaad thing for me creatively. I don't know why, but it seems that what ever tools I am using never really get put away because, well, they are on my desk so what is the difference between laying them on the desk or gathering them up and putting them upright into their container. And, of course, if I just leave them lying about I will be able to come back to them when I have my next craft project to do. Except, maybe for my next project I want to use pencils or inks instead of markers.....and so I do, and then I also have those on my desk as well as bits of paper and bits of ribbon and just, well BITS! And before I know it my table looks like he#* and I am overwhelmed with the mess and then shy away from my crafting table. I am very immature that way. Pathetic really. But now I have everything put away and when I have a card or project I pull out exactly what I need and and put it on my table. And if I need something more I GET UP AND GET IT! Shocking I know. But, when I am done, I have a very distinct place to put everything away. And, if I am interrupted before I am finished then all that my eyes see on my table is the very tools I am currently working with. Which, somehow, makes it easier for me to come back to my table. I know that most people want to have what they use most right in front of them at all times so it is in easy reach but for me that became much to clutter to my eye. So now just pulling out when I am using is working much better. And, since clutter translates to stress and inactivity for me.....the lack of clutter translate to peace, enjoyment and more crafting. So, I am happy.....and only feeling slightly ridiculous for taking sooooo long to find this out about myself. Here is a card I just made. 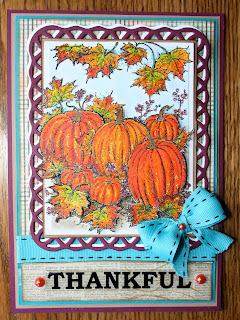 I love Fall images....they are another thing that makes me happy ;-D This is a Northwoods Rubber Stamp Co. image....one of my most favorite company's ever to color! And I colored this image in with Faber Castell Big Brush markers on watercolor paper. It's fast, easy and I really like the resulting intensity of color! I also cut the Spellbinder twice...and offset the colored cut over a white cut create a bit more dimension. I think I like this. And, when straightening my craft area I found this bit of ribbon.....so bonus! Glad you are happy with your craft room clean up! I am sure I need to do that too. your coloring is beautiful! So good to see a post from you, Sheila! 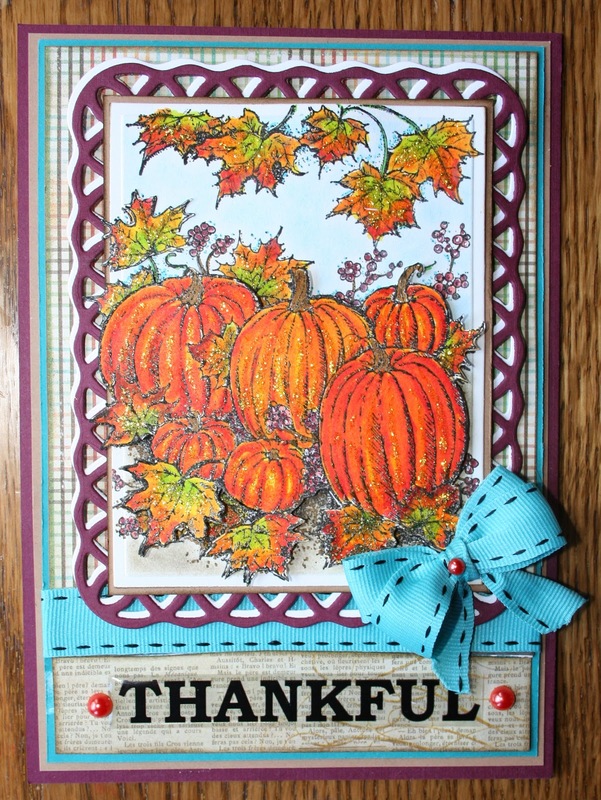 Glad to hear you've been enjoying the beautiful autumn we've had in the upper Midwest! I understand--I have a terrible time keeping my area clean. You wouldn't believe how I've actually made cards with a tiny space to work on! I did clean up the table a couple weeks ago & made the rule no paper to be left on the table after a card is made, but I've already broken the rule! Good for you getting everything organized & your card is beautiful! Love your post today Sheila. I've missed you! And I'm glad you have been so industrious cleaning up. My desk is a MESS! My actual workspace is now about 2 inches square, so this weekend I WILL make a start to clear the desk. I bought some storage boxes and got a pencil holder to store some stuff. You have inspired me to get my A-into-G! And I do have to say your pumpkins are delightful!